The salinity of the celery and sweet cooling cucumber are a perfectly balanced vessel for the kale, spinach, parsley, and romaine in this smooth low carb juice. 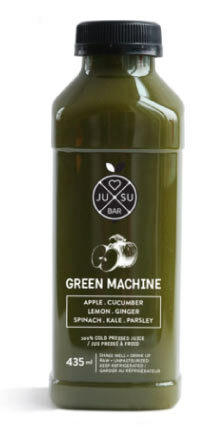 Very nutrient dense with concentrated vitamins and chlorophyll for efficient absorption into to your cells. Chlorophyll is an appetite suppressant and an excellent detoxifier of heavy metals & carcinogens but it also encourages the healing process and boosts energy. This product is ideal for a healthy diet because of it's low carbohydrate count yet very high vitamin, mineral and antioxidant count. This product packs very high levels of vitamins and antioxidants into a bottle. This product is ideal for a weight loss diet because of it's low carbohydrate count yet very high vitamin, mineral and antioxidant count. If you love Jade, you'll love these too! Our green juices are loaded with chlorophyll & other essential vitamins & minerals, leaves oxygenate, alkalize & detoxify the body.